I’m not really sure what possessed Ch4 to broadcast Rosemary’s Baby (1968) five days before Jesus’s B-Day, but I’ve wanted to watch this “horror classic” for a while now, so I’m not complaining. For those who don’t know, this slow-burning supernatural thriller stars Mia Farrow as ‘Rosemary Woodhouse’, a lively but naive young wifey who moves into an old-timey apartment building with her husband ‘Guy’ (John Cassavetes). At first the only fly in their loved-up ointment is the nosiness of an elderly couple who live in the apartment abutting their own… but as Rosemary learns more about the building’s bloody history, she begins to suspect that there may be more sinister forces lurking behind their partition wall, plotting to exploit the eponymous offspring residing in her belly. Is she going crazy, or is she really the unwitting pawn of an oppressively obsequious satanic cult? Dun-dun-dun! I’m sure that if I’d watched this film back when it was first released, it would have had the same unsettling effect on me that The Blair Witch Project did… but watching it in the wake of a batshit show like American Horror Story, I couldn’t helping finding it a bit of a drag, despite the occasional glimmer of twisted humour. On the plus side, Farrow is an incredibly appealing lead, and Rosemary makes for a very endearing heroine… heart-breakingly frail and vulnerable, but also wily and resourceful when she needs to be… you can’t help worrying over her, and hoping for the best, even though the chances of a happy ending grow more and more remote with every betrayal. Fun fact: Farrow was married to Frank Sinatra at the time, and had supposedly agreed to give up her career for him… so when she had the temerity to accept this role, the d-bag served her with divorce papers (via a lawyer) in front of the whole cast and crew! The director, Roman Polanski, wanted to call a halt to production for the day, to give her time to recover from the blow, but Farrow insisted that they keep working, because the show must go on and all that. What a trouper! Meanwhile, Ruth Gordon is a hoot as ‘Minnie Castevet’, the overly-attentive and eccentric old lady, who’s always on hand with stinky “lucky charm” necklaces, and bitter-tasting chocolate puddings. I can’t recall having seen any of her other work, so I’d be curious to know whether she was using her natural voice here or not… either way, her performance was impressive enough to bag a shelf full of awards, so yay for her. 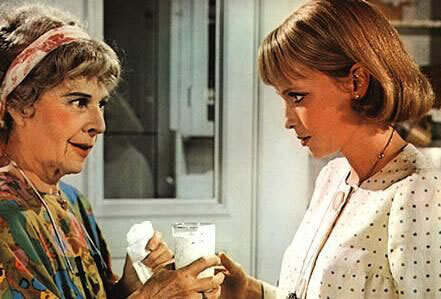 She’s also the only cast member to appear in the made-for-TV sequel, Look What’s Happened to Rosemary’s Baby (1976)… which I’d actually be quite curious to see, because I’m the sort of idiot who often derives more pleasure from watching a bad movie, than watching a good one. D’oh! This entry was posted in Rants about Films and tagged Mia Farrow, Rosemary's Baby, Ruth Gordon. Bookmark the permalink.